Liam Rosenior says the Football Black List initiative paints people from African and Caribbean backgrounds in a positive light. Football's Black List is a progressive initiative that will ultimately help end conversations about under-representation across the beautiful game, according to award-winner Liam Rosenior. Almost a third of professional players in the UK are black yet there are just seven BAME managers across the 92 clubs, and only one chairman. The Football Black List aims to shine a light on people from African and Caribbean backgrounds who are inspiring the next generation to consider roles in the game away from playing. The event celebrates its 10th anniversary on Thursday, and Rosenior is thrilled to be recognised as a role model for black people who are determined to forge a career in the football industry. He told Sky Sports News: "You see the Rooney Rule with the NFL now and we are speaking about implementing similar processes with our coaching establishment in this country, but now race - in terms of coaching in the NFL - is not being spoken about. "In a utopian world that is what we want. "We want race to be the last thing that people see but in order to do that you need to be positive in the way that you progress things forward and the Football Black List is a great example of that. "Events like this are so important because you need to celebrate what people bring to the industry. We've spoken a lot about being represented - about Black and Ethnic Minorities and being represented - in a positive light. "And I don't think there have been enough positive role models within the footballing industry or within the media that young people especially can aspire to be like and I think that's really important for the progression of our society. "So to be recognised as one of those people now - that is what makes it such a huge honour for me, and my family are really proud as well." 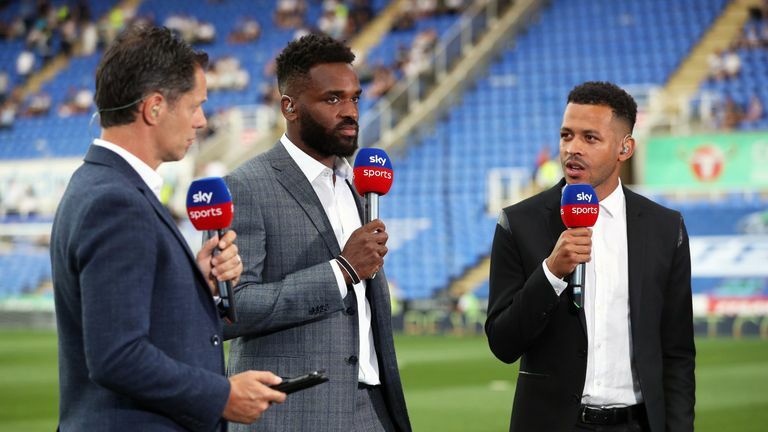 Rosenior, who counts Fulham, Reading, Hull and Brighton among his former clubs, is a regular studio guest on Sky Football's The Debate. Fans paid their respects to Cyrille Regis ahead of West Brom's match with Southampton in February. But it was a piece he wrote for The Guardian after Cyrille Regis passed away in January that saw him earn praise and acclaim from across the football family. "Not just myself, and my father especially, but everybody in football was absolutely devastated by Cyrille's loss," Rosenior said. "I thought for a few days about how I could give my perspective, on what he meant to me and my family. And if it wasn't for Cyrille and what he did, I wouldn't have been a professional footballer. "My father definitely wouldn't have been a professional footballer because what Cyrille did in being himself, in being outstanding - and being black - gave my dad a positive role model to make him believe that he could go on and achieve as a professional footballer. "Then the process went on to me and gave me and many other black and ethnic minority footballers [the same belief]. He broke down the barriers, so to get the plaudits that I got in writing the piece about him meant so much to me and so much to my family."